In this online exhibition, students will explore the experiences of Japanese Americans who were placed in internment camps during World War II, a period of history when racial prejudice and fear upset the delicate balance between the rights of citizens and the power of the state. The story is told through interactive galleries that combine photographs, objects, oral histories, and first-person accounts. Students will be able to share their responses to what they have learned on a comment board that is included in the exhibition as well as search more than 800 artifacts from the Smithsonian Collection. Also included are links to related activities, Web sites, a bibliography and more resources about this topic. 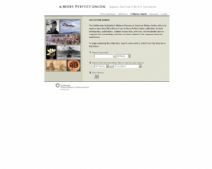 A non-flash version of the site is available at http://americanhistory.si.edu/perfectunion/non-flash/overview.html.